Former Uber CEO's bro-cabulary has its day in court. SAN FRANCISCO — Former Uber CEO Travis Kalanick's "bro-cabulary" took center stage Wednesday on the third day of Silicon Valley's most-watched trial. The Uber founder acknowledged he had repeatedly referred to former Google engineer Anthony Levandowski as his "brother from another mother." In one text message, Kalanick told him he wanted to "leapfrog" over the competition to lead the race to perfect autonomous vehicles, according to testimony in U.S. District Court on Wednesday. At issue is whether Levandowski downloaded files related to self-driving car technology and took them to Uber, thereby accelerating development of the ride-sharing company's autonomous driving operations. "Burn a village," Kalanick told Levandowski in a text message on March 1, 2016. Kalanick said he wasn't quite sure what he meant by that, but the attorney for Google's self-driving spinoff Waymo — which is suing Uber, claiming theft of trade secrets — said Levandowski clearly knew because he replied: "Yup." "I just see this as a race and we need to win. Second place is first loser," Levandowski wrote in another text message. Levandowski at the time was working on Otto, a self-driving truck start-up that Uber acquired a few months later for $680 million. Waymo's attorney focused on the obsession Kalanick and Levandowski had to win the autonomous driving race, at times drawing on the unique terminology Kalanick used. 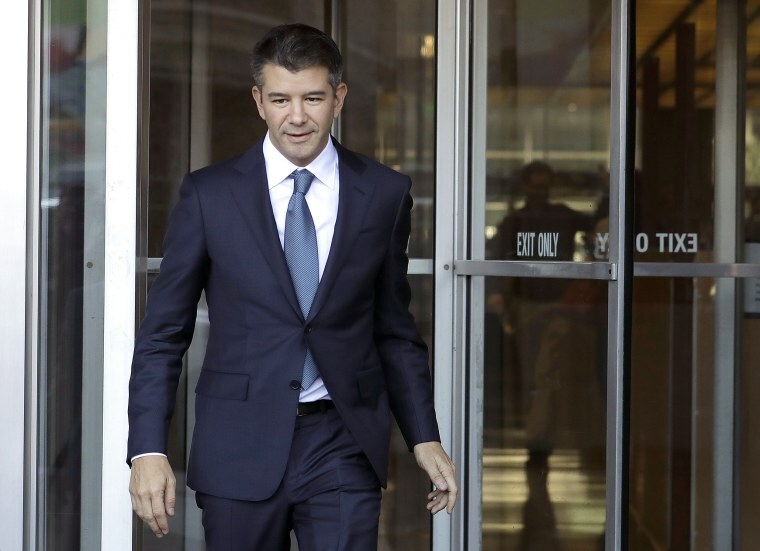 Notes from an April 2016 meeting between Kalanick and John Bares, a former director at Uber's Advanced Technologies Center, were read in court. They were littered with quotes from Kalanick, including: "The golden time is over. It is war time," and, "Cheat codes. Find them. Use them. Kalanick acknowledged they sounded like phrases he would use. When he was later asked to define "cheat codes," Kalanick said they were "elegant solutions" to problems that haven't already been thought of. Kalanick pointed to Tesla vehicles as an example of a creative solution for developing and testing self-driving car technology. Tesla's consumer vehicles have already driven hundreds of millions of miles in autopilot mode, collecting valuable data the entire time. Most other companies can only test self-driving technology in their own limited operations. During his testimony on Tuesday, Kalanick was asked to define what he meant by "jam sesh," which he said was a creative brainstorming session he had with Levandowski. When asked if he had hired Levandowski so Uber could have access to Google's trade secrets, Kalanick said that wasn't the case. "We hired Anthony because we felt that he was an incredibly visionary, a very good technologist — and he was also very charming," he said. But Kalanick and Uber apparently went to great lengths to protect the ex-Google employee, as they acquired his company and Levandowski came to work on Uber's autonomous driving efforts. That included an indemnification agreement with protection if trade secrets were taken from a former employer — in this case, Google. Kalanick's signature is on the indemnification agreement, but he said he had never read it. As CEO of a large company, Kalanick said he would sign "hundreds of documents a month," and often wouldn't have time to read all of them. Instead, he said he'd lean on his legal department to summarize the documents and, in some cases, empowered it to make decisions. But Kalanick knew there was a risk that Waymo could sue Uber as part of the Otto acquisition. "I think there's a lot of risks in a deal. That's certainly one of them," he said. While Waymo and Uber are foes in the courtroom, Kalanick credited Waymo, owned by Google's parent company, Alphabet, with sparking his interest in autonomous vehicles when he was picked up in one of Google's self-driving cars to meet with Larry Page before they closed a deal in August 2013. With only a couple hundred Uber employees at the time, Kalanick said he felt a "little brother, big brother" relationship with Google. He said he had heard "rumors" Google was getting into the ride-hailing business, and that Uber was constantly reaching out to see if the rumors were true. "We were optimistic in finding a way to partner," he said, noting a marriage between Uber's ride-hailing business and Google's prowess with self-driving vehicles. The jury trial, which began on Monday, has provided a glimpse inside the cutthroat competition in Silicon Valley over talent and technology related to self-driving cars. It's also unusual to see such a high-profile civil case play out publicly in court. Most lawsuits between companies are settled behind closed doors. Uber stands to be dealt a major setback if it loses the trial. Waymo estimated its damages at $1.9 billion.